A priestly family or gild having charge of the preparation of wicks for the Temple lamps (Sheḳ. v. 1; Yer. Sheḳ. v. 48d; Yer. Peah viii. 21a). The name is derived from the first person appointed to that office after the return from the Babylonian captivity (Tiḳlin Ḥadtin to Yer. Sheḳ.). 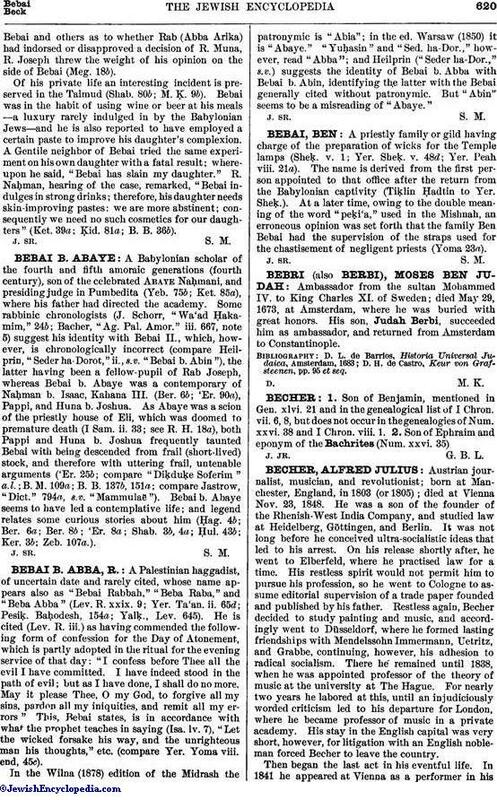 At a later time, owing to the double meaning of the word "peḳi'a," used in the Mishnah, an erroneous opinion was set forth that the family Ben Bebai had the supervision of the straps used for the chastisement of negligent priests (Yoma 23a).